After the huge success of last years Triple Threat Night, it's back for 2019! Following on from our Round 2 game against Gordon, the night will be working the same as last year, with the iPod Shuffle, Beer Pong tournament and a dress up, this years theme, Dead Celebrities. Tickets for the night are $30, which includes a song in the playlist, 2 free drinks, finger food and a bus into Ballarat. 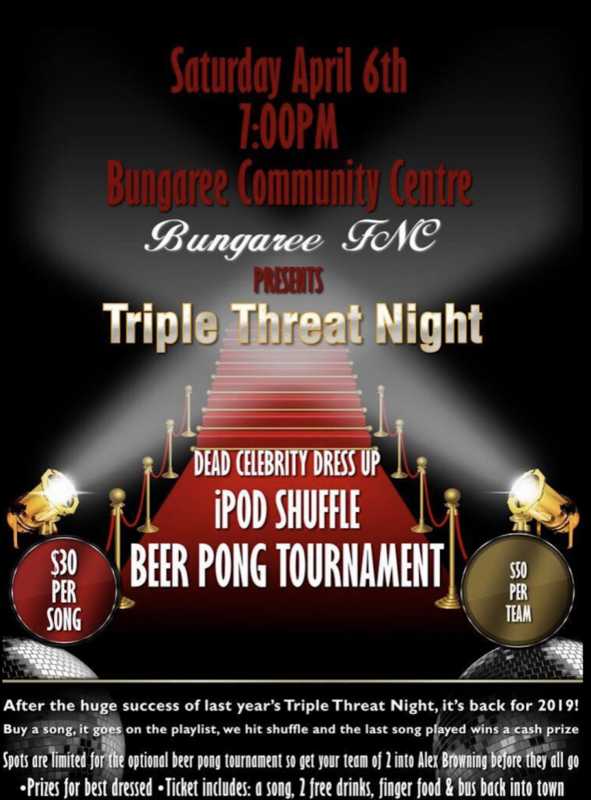 Entry into the Beer Pong tournament is $50 per team and there will be cash prizes for the winner of both the iPod Shuffle and Beer Pong competition, as well as a prize for best dressed. Spots for the Beer Pong tournament are limited so get your partner and team name into Alex Browning before they all run out. We hope to see you there for what is sure to another great night!